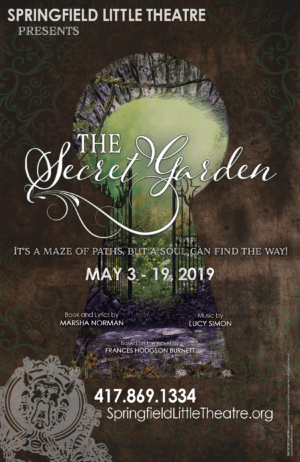 Springfield Little Theatre is generously offering our members a 20% discount on ticket purchases to see The Secret Garden at the historic Landers Theatre! Is your membership current? Keep an eye out for a members only e-mail with more information on how to get your discounted tickets. This enchanting classic of children’s literature is reimagined in brilliant musical style by composer Lucy Simon and Marsha Norman, the Pulitzer Prize-winning playwright of ‘Night Mother. Orphaned in India, 11 year-old Mary Lennox returns to Yorkshire to live with her embittered, reclusive uncle Archibald and his invalid son Colin. The estate’s many wonders include a magic garden which beckons the children with haunting melodies and the “Dreamers,” spirits from Mary’s past who guide her through her new life, dramatizing The Secret Garden‘s compelling tale of forgiveness and renewal. Springfield Little Theatre is a nonprofit, volunteer-driven organization energized by the highest artistic ideals that strives to entertain, educate, and involve the community in live theatrical productions and in the preservation of the historic Landers Theatre. For assistance with your Friends of the Garden membership, please contact Lexy at asaner@springfieldmo.gov or 417-874-2962. You may join or renew online at any time. For more information about Springfield Little Theatre, please visit springfieldlittletheatre.org.